Samsung starts its active operations on the smartphone market with launching original and unusual products — to all appearances, the company wants to make sure that its trademark produces a positive impression in this segment and to create a "passageway" to promote more traditional products. A compact and relatively inexpensive Series 60 slider, Windows smartphone with a built-in HDD, a slider-style communicator with a numeric keypad and 2.4" display — all these products have no counterparts and are very attractive to customers. Having launched such devices, Samsung is not in a hurry to offer "regular" devices based on open-source OS, but tries to conquer another segment — communicators with a "thumb-operated" QWERTY keypad. Of course, the choice is purely conjunctural, it has to do with high popularity of such devices in Western countries (the roots of this phenomenon are to be sought in the historically established popularity of RIM Blackberry communicators) as well as presumed high activity of Samsung's direct competitors in the segment of communicators with keyboards, based on Windows Mobile for smartphones. Motorola attracted attention to this segment with its Q model. Samsung SGH-i320 is a symmetric response from the Korean manufacturer to Moto Q. It copies all the main elements of its competitor — Windows Mobile 5.0 for Smartphones, landscape QVGA display, compact and slim casing, "thumb-operated" QWERTY keyboard. We expect a launch of the third product of this kind — HTC Excalibur, which also features all these basic elements. A combination of the OS for Smartphones and QWERTY keyboards in a light-weight and compact device is getting popular in the competing camp as well — Symbian OS/S60. The main apologist of this platform, Nokia, launches two models at once — the Q/i320-like E61 as well as Nokia E70, based on the original clamshell design. So, such devices are getting numerous. And Samsung tries to launch its own communicator on the market. 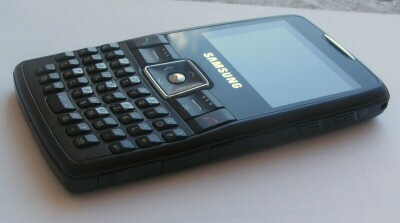 Samsung SGH-i320 is a candybar-style communicator with "RIM-like" design, characterized by a wide case, landscape orientation of the display, and compact QWERTY keyboard that takes most part of the front panel. At the same time, the device is slim, it's just 11.5 mm thick, which is very little for a Windows-based device. The communicator does not weigh much (95 g), but it's subjectively "heavy". At least its thinness suggests the idea that the i320 must be a tad lighter that it actually is. Its wide and slim case poses higher requirements to the quality of materials than regular handset cases. But the i320 model uses plastic of lower quality than other Samsung devices — the plastic is rather soft. It resembles the plastic used for the D820. As a result, the i320 case possesses the same drawbacks — it squeaks when squeezed tightly and gives way a little, when you try to twist it, which is also accompanied by squeaks and cracks. Like the D820, the new communicator is painted black. Its surface texture is mostly semi glossy. The gloomy exterior is brightened up by a glossy insert over the display, a few silver decorations, complex relief of the keyboard, and a large bright display. The i320 looks rather ineffective, like a typical workhorse. Keyboard. Let's proceed to the main functional element of the case — "thumb-operated" QWERTY keyboard. The main group of keys consists of 37 mechanical plastic minibuttons (to all appearances, they are made of the same plastic as the casing). The buttons are rectangular, they have a complex "ridge" profile (vertically). All buttons are practically the same in size, except for the 0/Space button, which is twice as wide. The buttons are rather hard to press. Accidental key presses are not likely, when the communicator is lying in your pocket or when you take it out. Tactile feedback is not very good, you will have to push them hard to be sure they are pressed. A central group of alpha keys is used for typing phone numbers (phone mode). Numerals are written on alphabetic keys (two buttons for each numeral). The reason is the keys are too small. They absolutely won't do for quick typing, as your fingers are sure to hit adjacent keys. That's why Numeral 1 can be typed by pressing "E" or "R", 2 — "T" or "Y", etc. When typing numerals, finger tips are supposed to hit two keys at once (the first button pressed will be used for input) or one of the paired buttons (the same effect). That's what usually happens in practice. But you won't manage to work with it as confidently as with a usual phone keypad, at least at first. It's much more convenient to press numeric keys with a finger-nail. But in this case fast typing rates or blind typing are out of the question. When typing text, each key inputs a corresponding letter. You have to use your finger-nail, as it's very difficult to press necessary buttons with your finger tips irregardless of their size, if you are a grownup, man or woman. Besides, you should press the lower half of a button, inclined to a user, or your finger-nail may slip off. In this case only half of the button surface is useful. As a result, typing text on the i 320 requires precision and concentration. One of the key advantages of "thumb-operated" keyboards is their convenience of typing with a single hand, when you stand still or on the move. You can type with one hand (with the one that holds the device), if we don't take into account specific inconveniences when you press buttons from the 3rd-4th rows on the right. That is technically you can do it, but it's much more convenient to type with a free hand, while the other one holds the communicator. On the other hand, it's quite difficult to type on the go. The problem is not in mechanical drawbacks of the keyboard, but in inevitable distraction when you walk. These distractions lead to mistypes as well as to a much lower type rate. That is, the problem is not in individual keys, but in the keyboard design — its dimensions, profile, and key sizes. As a result, the i320 keyboard is not very good to type a phone number. You'll never manage to type as fast and confidently as with large numeric keys. Pairing alphabetic keys to type the same numerals helps, but not much. Text typing rate is higher than in case of Multitap or predictive input, but the difference is not very big. Blind typing on this keyboard is almost out of the question, both numbers and letters. It requires full concentration. Of course, when you use it, typing text is not hindered by jolts as you move, which are a serious problem for virtual keyboards on touch screens. So it's very convenient to work when sitting in a passenger seat, but when you walk, you will hardly manage to concentrate on typing to maintain the sufficient tempo. It's typical of all input modes. Such drawbacks are not typical of all "thumb-operated" keyboards. Let's take palmOne Treo 650 for example. It has a similar keyboard, but it's much more convenient. This communicator is a tad wider, so the keys are spaced out. Besides, its keys have a better shape, profile, and tactile feedback (not that tight, the action is more distinct). As a result, they are much nicer to work with. Samsung engineers were initially restricted by a narrower casing and the concept of an ultra thin model, which limited button height and the choice of key mechanism. But even in this case, we think that they might have come up with a better solution. Along with QWERTY keys, the communicator offers a control group, typical of devices with Windows Mobile for Smartphones. These keys are rather large and convenient to use. Other elements. A typical element of Samsung smartphones is a rich set of side buttons. The i320 has a rocking button for volume control on top of the left side. The right side contains a button to activate voice functions (a brief press on the key — voice recorder, press and hold — voice control) and call the system menu. The latter is usually activated in Windows smartphones with the On button. But as the Off function in the i320 is delegated to the End button, a separate button had to be added for the menu. Side buttons are quite large and offer a distinct profile, so they are easily identifiable by touch. The back of the device houses the lens of the built-in 1.3 Mp camera with a narrow slit above for a LED. Perforated grilles at the sides hide a stereo couple of additional speakers that are responsible for ring tones. The top of the device is free, but for the IR-port. Interface connectors are located in the lower half of the right side: one for the stereo headset, the other for the USB cable and a charger. Both connectors are covered with plastic lids on sliding kapron "axes". To all appearances, the i320 display is the same as in the i300 smartphone and a number of modern Samsung handsets — 2.2" 240x320 (portrait orientation) TFT panel supporting 262 thousand colors. The image quality is very high - saturation, brightness, and contrast are very good, as usual for Samsung. Here are some of its characteristics we want to dwell upon - its grain is practically unnoticeable (thanks to its small width and reduced contrast of interpixel gaps, pixel structure of the display can be seen only when you scrutinize it; Samsung's display surpasses a similar panel of the Qtek 8310) and wide viewing angles. The display is not transflective, but it's well readable under direct sunlight due to its high brightness (about 250 cd/m2). The battery bay of the i320 is rather unusual. The battery is moved to the left (right opposite to the Bluetooth label, but the adapter or its antenna are probably not there) and is held in the seat by frictional force. The SIM slot is located in the free part of the bay and it's not blocked by the battery. It has a slit design with metal pressure plates inside. But the battery blocks the microSD slot (T-Flash), which is also located at the side of the battery bay, its slot facing the battery. This design obviously makes hot plugging of memory cards out of the question. The battery bay is covered by a simple sliding lid, which is very easy to install and remove. Samsung SGH-i320 is equipped with Intel PXA270 processor, its clock frequency is unknown. The device comes with 64 MB of system memory and 128 MB of flash memory. You can use a mini SD card (T-Flash, maximum capacity — 1 GB), the slot for such cards is situated near the battery, which is very inconvenient, if you change cards very often. The smartphone works in GSM 900/1800/1900 MHz standards and supports GPRS Class 10 and EDGE. Wireless interfaces (besides GSM) include Bluetooth 1.2 and IrDA; wireline interface — USB with a proprietary Samsung jack. The battery can charge from USB. You can also choose a USB mode for the device — it can act as an ActiveSync client or a USB Mass Storage device. But there is one limitation in the latter case — only a memory card can be used for a USB drive, not the system memory of the communicator. If you have no microSD card, you won't be able to set the Mass Storage mode. On the surface of it, the i320 is quite a typical smartphone. Indeed, many of its components do not differentiate the new product from competing models. The difference lies mostly in details. The most important difference is certainly the PXA270 processor, which is not used in smartphones from the main competitor — HTC/Qtek. The clock frequency is not mentioned in the specifications, but even subjective performance comparison of i320 and Qtek 8310 shows an advantage of the Samsung smartphone - its interface operations are performed noticeably faster. So we can assume that the processor clock exceeds 200 MHz. System memory capacity is doubled, which is justified. Of course, if you actively use media data, you will still need a memory card. In this case the size of built-in memory becomes irrelevant. But if the device is used as a business phone without a memory card, it's only natural to have more built-in memory, especially as it makes no sense for the manufacturer to save on flash memory, considering the current prices. Bluetooth 1.2 allows to significantly accelerate a file exchange rate between the smartphone and another device with the same interface version (for example, a computer). The average file transfer rate is 65-75 kBps, it will take only about 20 seconds to transfer a 3-4 MB MP3 file. Another advantage is the support for Bluetooth A2DP profile, which allows to use wireless stereo headsets. This option is typical of all Samsung models, manufactured in 2006. The Korean company introduces this standard most consistently, while its competitors introduce support for this profile unsystematically and not always successfully. By the way, the i320 uses Bluetooth drivers from an operating system (that is developed by Microsoft) with their poor functionality and terrible user interface, which diminishes advantages of the smartphone in this respect. We can also note that the device lacks Wi-Fi. Samsung is outscored by HTC here, who actively uses wireless support in its top smartphones. But Samsung's decision has two excuses: (1) the i320 is not a flagship, (2) WLAN support makes a device much more expensive, while its advantages cannot be used by all consumers. 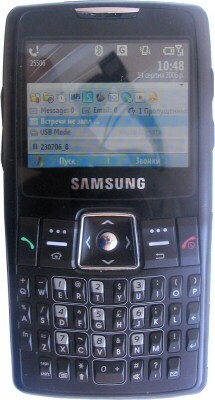 Samsung SGH-i320 works under Windows Mobile 5.0 for Smartphones. It's the first smartphone from Samsung with the new OS version. Programs and utilities installed in this smartphone mostly come down to the choice of OS developers. But Samsung actively adds useful applications. A noticeable difference of the i320 GUI, which migrated here from the first Samsung smartphone (SGH-i300), is the replacement of the active desktop from Microsoft by the auto-hiding panel, developed by Samsung programmers. It consists of a number of vertically arranged active fields. You can switch between them by moving the joystick vertically, horizontal movement chooses an option inside a field. The panel offers the list of recent applications (10 icons versus 5 ones in the standard shell), indicators of unread messages of any kind (SMS, MMS, e-mail, instead of a single combined standard field), an indicator of missed calls (if there aren't any, it displays "0"), a field with reminders about oncoming events, links to the root folder of a memory card, an applet that controls the USB connection mode, as well as a media player field, which displays the title of a current song and a playback command (Play — if the song is stopped, Pause — if it's being played). Having reached the bottom field, you can hide the panel by moving the joystick down - it will then display only a player status. It's done to free the desktop. System status indicators as well as operator's logo, date and time are displayed slightly differently than in standard Windows Mobile — it was modified to adapt the system to the Samsung smartphone in the first place. If we examine the list of installed programs, we can find the following additions from Samsung. Alarm — a very interesting alarm clock that allows to program one complex and four simple recurrent alarms. In the first case, you can set three alarm times and choose from a table on what days and at what time the alarm should go off (one time a day only) — it's an advanced variant of the traditional programmable weekly alarm, but it takes into account that a user may wake up at different times on different days. Usual alarm clocks allow to program only one daily alarm, or disable it for Saturday and Sunday, or Sunday alone. D-Day — to program event notifications, single or recurrent every year. This utility is less interesting, as its functions are mostly duplicated by the standard Windows Mobile calendar. World Clock allows to switch between three selected time zones. Camera — this applet can use functions of the built-in camera. The device can take 1280x1024 photos and shoot 320x240 video. Picsel Viewer — this Windows Mobile program allows to browse MS Office documents as well as graphics files. Such program has become a standard for all business-class handsets and smartphones from Samsung. It's available almost in all models of this class, adapted to a given platform. Voice Assist — a system of voice commands, which allows to search and call contacts from the address book and run applications with voice commands without preliminary training. Of course, the system is for English speakers, voice recognition quality depends on your pronunciation. It's usually mediocre in our parts. 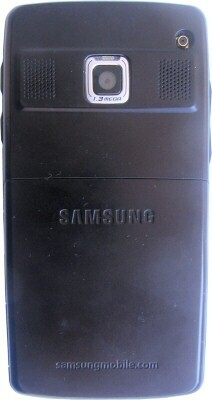 Along with the standard utilities, the Accessories group contains the Samsung Program Launcher applet (it's very useful in the SGH-i750 communicator, but it's of questionable use for a smartphone; to all appearances, the program was added to the package for no particular reason, out of generosity), as well as a powerful stop-watch that can store up to 100 records (will you remember what each record means?) and work in the background. Samsung SGH-i320 provides normal reception quality. Battery life of this device in the "phone" mode (that is, when multimedia and smartphone features are used only from time to time) slightly exceeds three days, if you do not talk much. You can use files of various formats for ringtones (WAV, MIDI, WMA, MP3). A couple of stereo speakers are moderately loud, so you'd better choose simple distinctive melodies for your ringtones. The vibra alert is of average strength, it's usually enough for everyday usage. From the technical point of view, Samsung SGH-i320 is quite good. It's a good solution based on the Microsoft smartphone platform, the first in the Samsung line to use the latest OS. Being a representative of the second generation of Windows devices from this manufacturer, the i320 will most likely be a reliable and thought-out solution. Though it's not a top device, its configuration is quite interesting, especially its fast processor and flash memory, expanded to 128 MB. Unfortunately, the unusual layout is rather a disadvantage. The problem is not in the unusual "thumb-operated" keyboard, but in its objective drawbacks in this model. The keyboard surface is too small for a truly ergonomic solution. Besides, the space is not used rationally (only half of the surface of "ridged" keys is actually useful), and the keys are very tight to press. But by making the device a tad wider, the above-mentioned layout allows to create the thinnest design for the Microsoft smartphone platform (except for the HTC Star Trek clamshell), which is definitely one of the pros of this model. As a result, the Samsung SGH-i320 is evidently not intended for the masses. Designed as a response to Motorola Q, this device is the first and only (so far) Windows smartphone with a keyboard in our parts, because the American product is delayed. This solution will not do for absolutely all potential users, most of them will prefer devices with usual phone keypads. But if you don't mind experimenting, it will be interesting to meet the SGH-i320.